This publication I want to dedicate to the most interesting place of the Semirechye, on the diversity of landscapes, - the Altyn-Emel nature park. 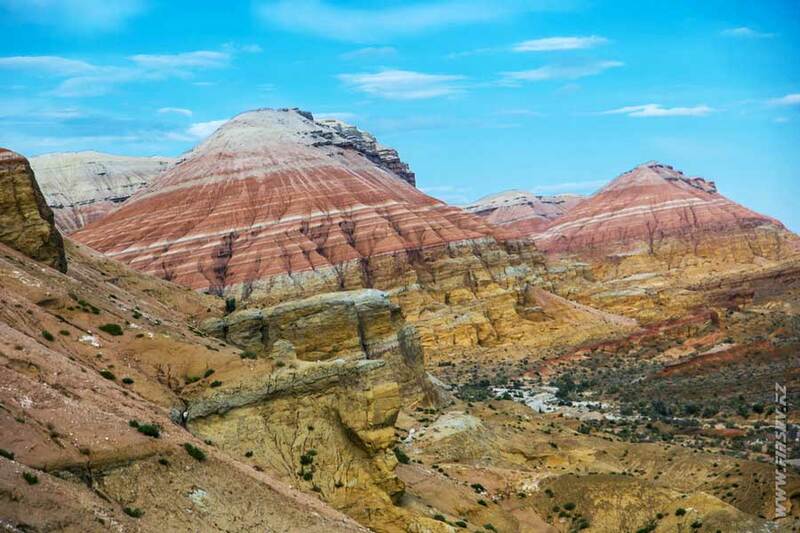 From the article you will learn about the main attractions of the natural park, such as Singing Barkhan, Mountains of Aktau and Kututau, Paleozoic Massif of Small and Large Kalkans, Barrows of Besshatyr, and how to get there, where to stay and the program of tours offered. The State National Nature Park is located in the valley of the Ili River, Altyn-Emel is bounded from the south by the Ili River and the Kapshagai Reservoir, from the north of the Dzungarian Alatau, from the east by the low mountains of Aktau and it is measures about 155 km from east to west and 65 km from south to north. 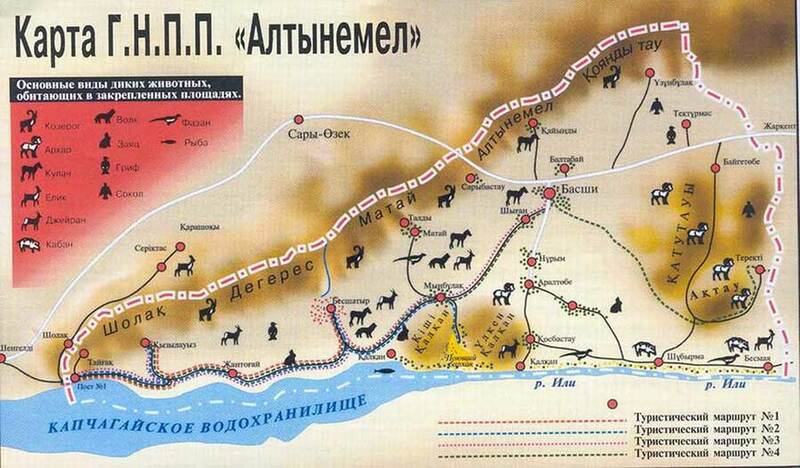 The name Altyn-Emel has Mongolian roots and it is translated as a "golden saddle". According to the existing legend, in the summer of 1219 Genghis Khan's troops moved through this valley to conquer Central Asia. At sunset, seeing mountains covered with yellowed grass, the great commander exclaimed "The golden saddle!" If you look closely, the Altyn-Emel pass really resembles a saddle in appearance. This, though, a beautiful but still a legend, as in the conquest of Zhetysu Genghis Khan did not take personal part, but sent his forces headed by Zhebenion. You can get to the nature park from Almaty by Kapshagai highway, first passing the city of Kapshagai we go to Saryozek village along the modern highway, then we turn to the direction of the city of Zharkent and drive along the asphalt road to Basshi settlement. The distance from the center of Almaty to Basshi, according to Google maps - 261 km, the journey time is 3 hours and 28 minutes. Entry to the natural park is paid, you must pay a visit, car parking and a place for a tent if you are not traveling with a tourist group. Tariffs are as follows: a visit per person for one day - 800 tenge; car entry - 200 tenge per day for one car; place for a tent, day – 2,000 tenge. There are two options for payment of fees, the first to go to the Central Estate of the Altyn-Emel National Park in the village of Basshi and pay there, in the morning on weekends, small queues are possible, the second one is to buy permits in Almaty for self-visit to the natural park with payment of all fees. Previously, an independent visit to the natural park was possible only accompanied by a huntsman, whose services cost 1,000 tenge per day according to an official document. The huntsman, who is also an inspector-conductor, shows the way and observes the rules of behavior in a natural park. At the moment, the services of the huntsman can be abandoned, well, if you have doubts about your ability to navigate in the park, you should probably take advantage of his services. Reference to the official order on the size of tariffs for services provided in the Altyn-Emel Nature Park (Appendix 12). The road to the Aktau mountain from the village of Basshi through the villages of Nurum and Araltobe is asphalt, then the paved primer begins, the road is not asphalted because the park is natural so administration don’t want to create additional discomfort for the local fauna residing here. 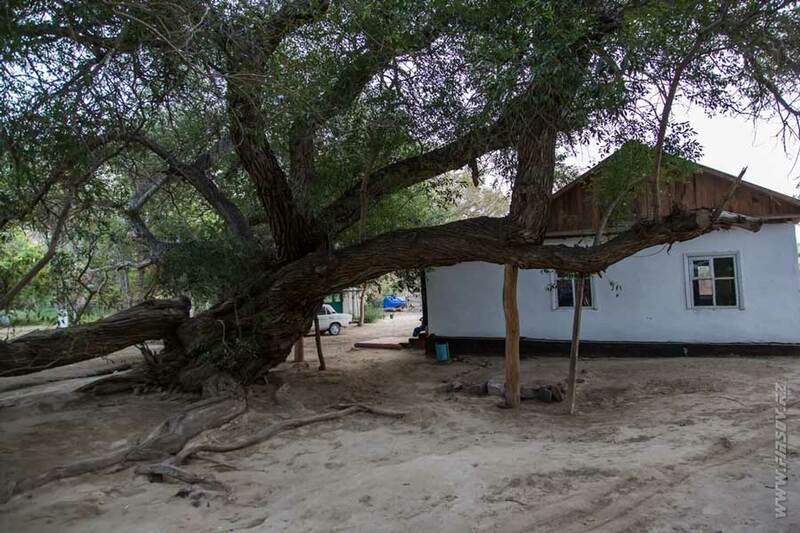 On the way to Aktau, tourist groups usually stop near a 700-year-old willow that grows on the cordon of Cosbastau, 30 km south of Basshi village, according to local legend the army of Genghis Khan once passed by this willow. Here you can relax, collect water and go to the toilet. The way from the willow to the Aktau Mountains about 45 km. Herewith most of the route passes along the mountains of Katutau, which can be visited on the way back after visiting the Aktau mountains, since the viewing of Katutau takes much less time. At the foot of the Aktau mountains there is a parking place where authentic gazebos for rest and toilets are installed, here you can also set up a tent. For information, in no case you should not build a fire from the plants growing in this area. Aktau from the Kazakh language - the White Mountains, although in fact they are multi-colored. According to official sources, Aktau is the Cretaceous mountains that formed 25-30 million years ago in the Cenozoic era and are a world-famous paleontological deposit. In these places, archeologists have repeatedly found the remains of prehistoric animals. The main feature of these mountains is the complete absence of vegetation, so the landscape resembles fantastic alien landscapes. Katutau from Kazakh translates as frozen mountains, there is also a variant of "severe mountains". In the Perm period, two large volcanoes operated in this place, so the mountains are composed mainly of lava and other volcanic rocks. Turn in the gorge, where there are spills of frozen lava, is equipped with a pointer. Singing Barhan, Oshaktas and the Sak Barrows of Besshatyr. 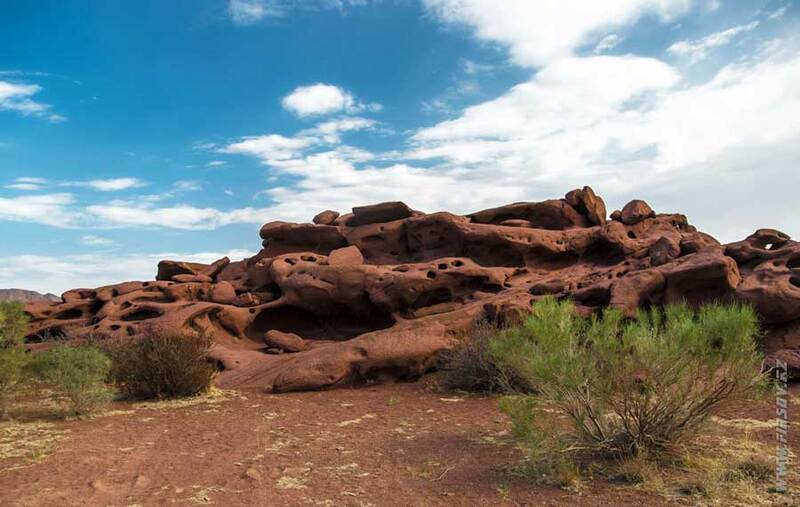 The most famous landmark of Altyn-Emel Park is Singing Barkhan (Aikai Kum) is located 50 kilometers south-west of Basshi settlement. 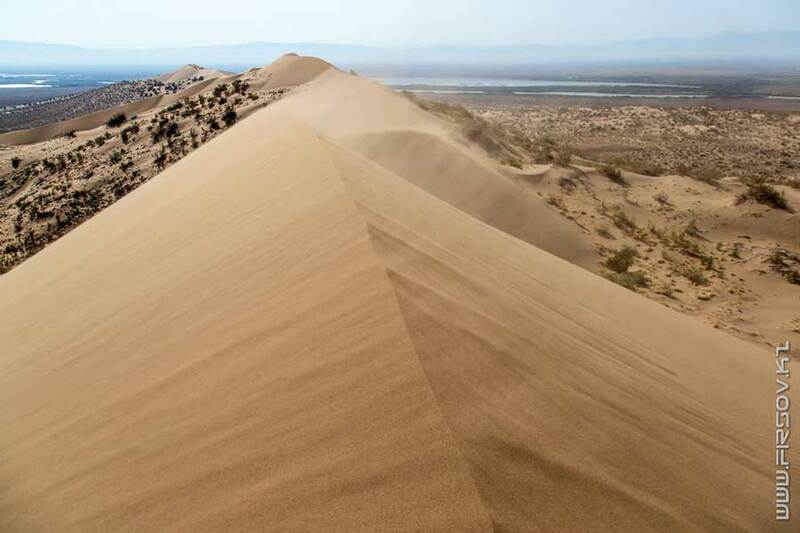 The barkhan itself is a sand dune about 150 meters in height and 3 km long, the barkhan is called "singing" because of its deep distant sound-like organ vibrating hum, which at times comes from it. The voice of the barkhana is heard only in dry weather, if the wind is blowing, the stronger the gusts the louder the "singing", or if you walk along the barkhan. 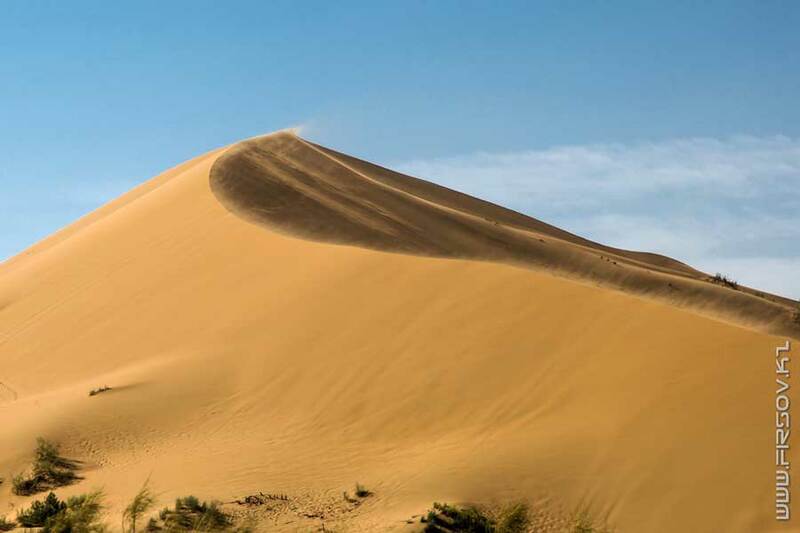 There are many hypotheses explaining the "singing" of barkhan - the friction of moving particles when sand particles are scattered along the slope, resonance or electrization of sand. However, there is still no exact answer as to why this is happening. Legends say that under the sands of the barkhan the great Genghis Khan and his faithful soldiers are buried, and the sand sings, when the soul of the khan, "exhausted by spiritual torment, tells his descendants about his exploits." 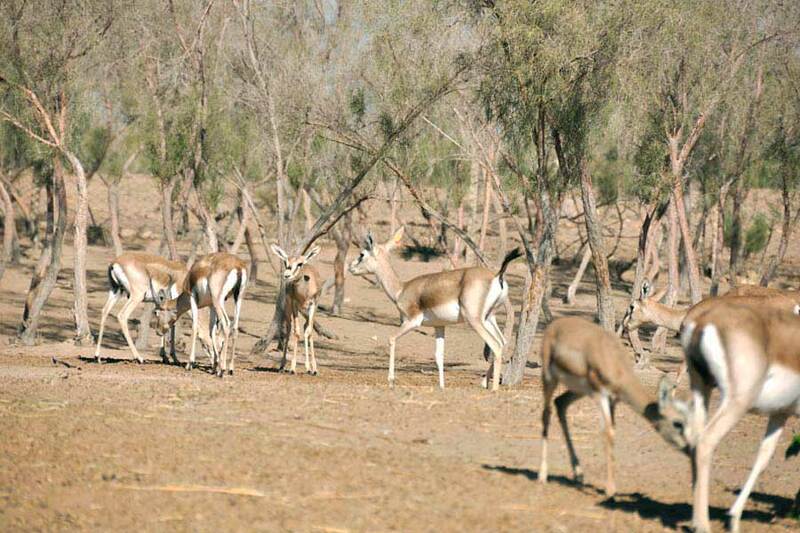 Despite the fragility of sand, Barhan does not roam and has been in the nature park for several thousand years. This is due to the mountains of the Big and Small Kalkans, which prevent the blowing of sand by strong winds blowing from different directions at different times. Here is a special direction of the wind rose. That is why the dune always has a sharp crest. Although the height of the barkhana is only 100 - 150 meters, climbing to the top is not so easy, since when you lift your feet they are buried in the sand and on the crest the wind blows almost constantly. 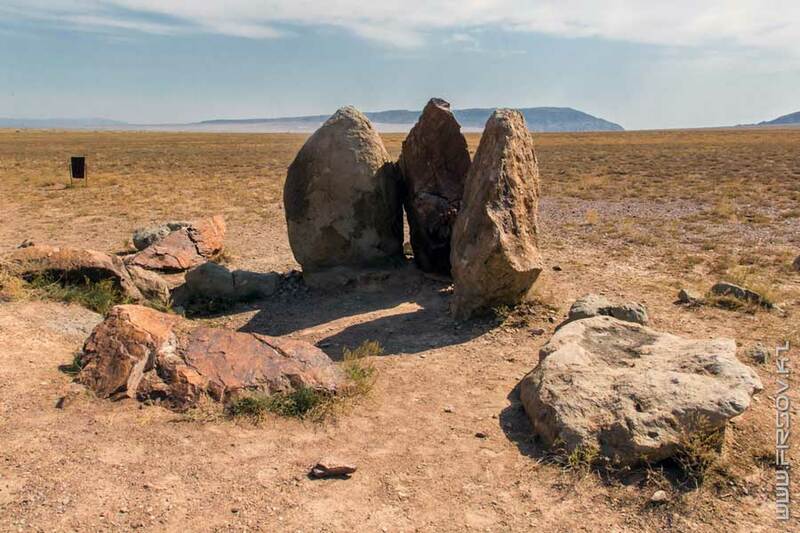 North-west, at a distance of 10 km from Singing Barkhans there are stone steles Oshaktas (Oshak - hearth, tas - stone in Kazakh) consisting of three large stones up to 2 meters high. The steles were installed a long time ago, according to one version, they were signal towers on which fires were lit in case of approaching the enemy. Another legend says that the stones were installed here in 1219 on the orders of Genghis Khan, a giant cauldron was installed on the steles on which food was prepared for the soldiers of the great commander. 20 kilometers to the west from the Oshaktas steles there is a complex of burial places of the Saka epoch – the royal barrows of Besshatyr (five tents). Besshatyr is a necropolis of the Saka leaders, who lived on this territory in the VI - IV centuries BC. 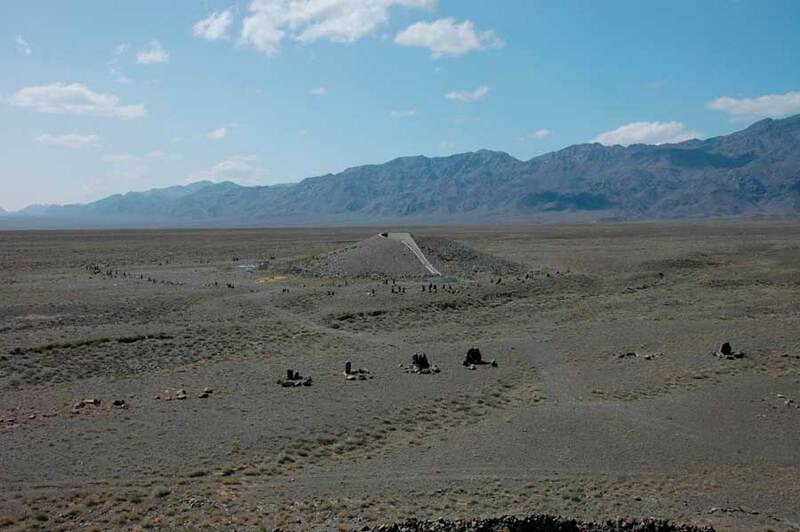 In total, there are more than 30 cemeteries, the largest burial ground is the Great Besshatyr Barrow has a diameter of 105 meters and a height of 17 meters. In one of the barrow was a wooden building made of massive trunks of Tien Shan firs. On the territory of the complex you can see the remains of settlements, numerous rock carvings of animals and hunting scenes. Since Altyn-Emel is a natural park, it is famous for its rich fauna. In the park there are more than 70 species of mammals, including 7 Red Book species: stone marten, bandaging, Central Asian river otter, Tien Shan mountain ram, snow leopard, gazelle and kulan. Kulans here lived for many centuries, but were completely destroyed by the 70th years of the 20th century, in 1978 23 kulans were brought to this territory. Today in the park there are about 700 of these rare animals. 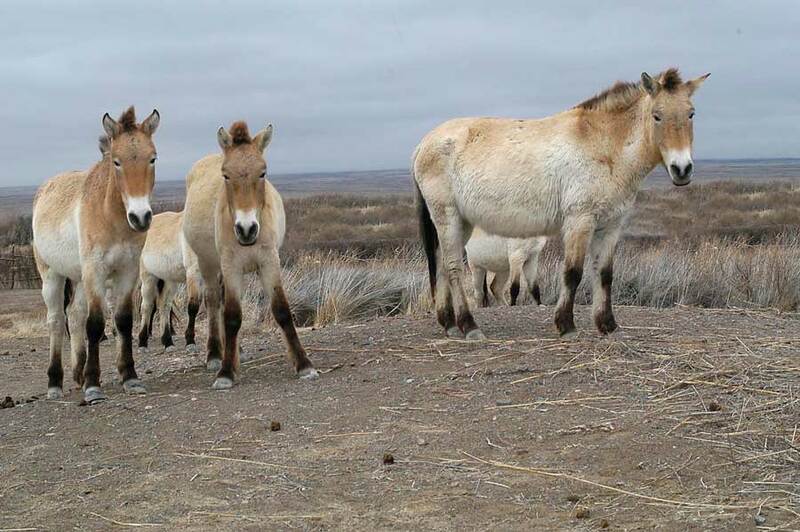 Another rare species, Przewalski's horse, disappeared from Kazakhstan in the century before last, and from wildlife in general - in the second half of the last century. To date, wild horses have survived only in several zoos in the world. In 2003, several horses were brought from Germany to restore the species in the wild. Now the horses are already familiar with the new conditions. Also on the territory of the park there are about 200 species of birds, of which 18 species are included in the red book: the black stork, the white-eyed duck, the osprey, snake-eagle, the eastern imperial eagle, the golden eagle, the white-tailed eagle, the vulture, the lammergeyer, the himalayan vulture, the saker falcon, the crane, the demoiselle crane, the houbara bustard, brown pigeon, black-bellied pea, the Pallas's sandgrouse, owl. In the mountains nesting golden eagles, snake-eagle, lammergeyer, the saker falcon. Reptiles are represented by 25 species. In the mountains, the usual asymblepharus, gloydius halys, steppe adder, elaphe dione, and in the desert and semi-desert - steppe turtle, phrynocephalus, scintillation and gray gecko, steppe agama, several species of eremias, snake-arrow and others. Accommodation is possible in guest houses located on cordons and in the village of Basshi. The cost ranges from 3,000 to 8,000 tenge per day per person. Also in the village of Basshi there are hotels with more comfortable living conditions, prices from 10,000 to 20,000 tenge. For lovers of unity with nature, you can spend an overnight stay in tents on the territory of the natural park itself. The most important water, take it as much as possible. There are several sources in the nature park, but they still need to be reached. Food should also be taken away. There are no shops on the territory of the natural park, therefore you can replenish supplies only in the nearest villages. If you do not plan to stay in the guest houses, then you need to bring a tent, sleeping bags and other tourist attributes. Also, do not forget about comfortable shoes, clothes, hats, sunglasses, sunscreen and documents, just in case. Finally, the fuel. From the last refueling to the natural park and back about 160 km. Plus, for the park itself, the mileage will be at least 300 km, in case of visiting all available attractions, then approximately 500 km. Thus, keep in mind that the fuel reserve after refueling should be at least another 700 km. The cost of tours depends on the chosen program and transport. Group tours start from 20,000 tenge per person, jeep tours in the form of wild rest (overnight in tents at the foot of Aktau mountains, preparation of hot food by guide) from 45,000 tenge per person, jeep tour with accommodation in a guest house from 60,000 tenge per person. Tours are usually designed for two days, meals usually do not include lunch on the first day, so you need to bring your food and drinks on the first day. 9:30 p.m. return to Almaty city.